With population aging and youth uninterested in military, who will defend Japan? TOKYO — Takahashi Hideaki is a quick-thinking 31-year-old with fast, fast feet. At Taito Station, a video game mega-arcade in downtown Tokyo, his footwork mastery of “Dance Dance Revolution” draws a crowd. Think “Guitar Hero” on speed. Hideaki is exactly the type of citizen Japan’s military needs to recruit. Japan’s population as a whole is dropping, but the drop is especially notable among those aged 18 to 32, Japan’s recruitment eligible. That population has fallen from 9 million in 1994 to 5.6 million in 2018, Japan’s defense ministry said. Its Self Defense Forces have missed annual enlisted recruiting goals for a number of years. The average age of the Self Defense Forces is over 35 now. But it’s not just a numbers problem. As a whole, Japanese youth don’t want to serve. “For the JMSDF, [Japan Maritime Self Defense Forces] I think it may be the most important issue,” said Capt. Toshiyuki Hirata, JMSDF deputy director of plans and programs. When asked if he would join, Hideaki shakes his head politely. “No, I would not,” he says, through questions and answers we run through Google translate. It’s the same answer a few minutes later with another young Japanese male, one of the arcade employees. It happens again with a young male guitar store employee down the street, and his female sales assistant. They are military age, but they would not serve in Japan’s 220,000-person military. “The majority of [young people] don’t even think about that,” the guitar store employee said. Money isn’t really a deciding factor either, he said, although Japan’s military salaries are low, similar to U.S. blue collar wages, and unlike the U.S., military service does not lead to money for college in Japan. The reasons Japanese youth choose not to enlist are cultural. “We are so afraid of war. Anything that seems to be related to war,” the guitar store clerk said. But Japan needs its young people to change their minds. The Self Defense Forces are undergoing their biggest transformation since World War II. Each shift has largely been driven by China’s increased militarization, but potential threats from North Korea and Russia have prodded Japan as well. While neither China nor Japan signal that conflict is coming, there is a nervousness that Japan is not yet ready. “But the problem is … if I talk about these kinds of issues at a high school, most of the students would not really be interested in them,” Adachi said. Instead, recruiters emphasize the sexier parts of service, getting to drive a tank, or fly a jet. It doesn’t always work, especially for the Japan’s Maritime Self Defense Forces. So JMSDF is considering adding wi-fi to its ships. Japan is looking at other options too. Currently six percent of the Self Defense Forces are women; Japan is expanding roles for them, such as serving on submarines. In case numbers don’t improve, Hirata said the military is also thinking about what parts of its SDF could potentially be handled by drones, both above ground and underwater. And it’s taking steps to slow its own personnel loss. In October it increased the age limit for recruiting from 26 to 32, and it is implementing two modest increases in how long officers must serve before retirement, extending their contracts by one year in 2020, and adding a second extension five years later. Still, what the military really needs is a way to change the population’s mindset about military service. Prime Minister Shinzo Abe supports revising Article 9 of the country’s constitution to insert language that states ‘the Self Defense Forces are constitutional’ as one way it hopes to support service. The military got its biggest recent boost from its mobilization and response to Japan’s 2011 devastating earthquake and tsunami. That tsunami response moved the numbers on general perception of the JSDF, the defense ministry said, citing internal polling that showed 90 percent of Japan’s population has a favorable view of the Self Defense Forces. That number plummets to 24 percent, however, when asked if they would recommend military service to a child or friend. 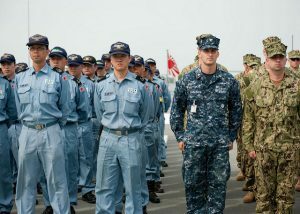 For Hirata and Japan’s naval defenses, getting past that barrier will be critical to Japan’s future.